Yes, even an old humbug like me can get into the holiday spirit. I’m about to go cook glorious food with the marvelously talented Simon from ferdiesfoodlab, I had a spectacularly successful day yesterday buying holiday gifts for my family, and I’m leaving in just FOUR SHORT DAYS for a Caribbean vacation. So as you can imagine I’m feeling pretty all right today. Because I’ve been sick for much of this week (cue sympathetic murmurs and get well wishes) I haven’t done much (read, any) cooking. But buzzing away in the back of my brain is a promise I made and have not yet fulfilled. 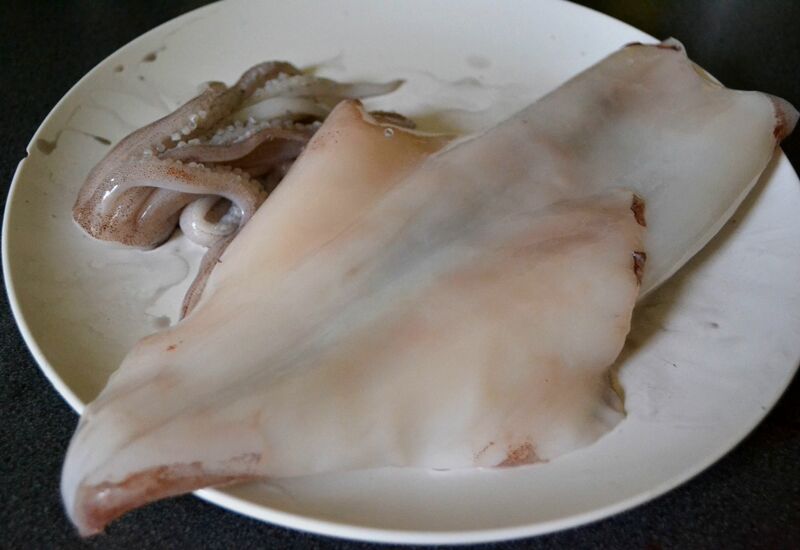 A few weeks ago I blogged a Malaysian Squid Curry, and David from The Clean Platter (a genuinely funny, beautifully-written blog by a fearless Midwestern cook) asked me to write a post on how to clean squid. 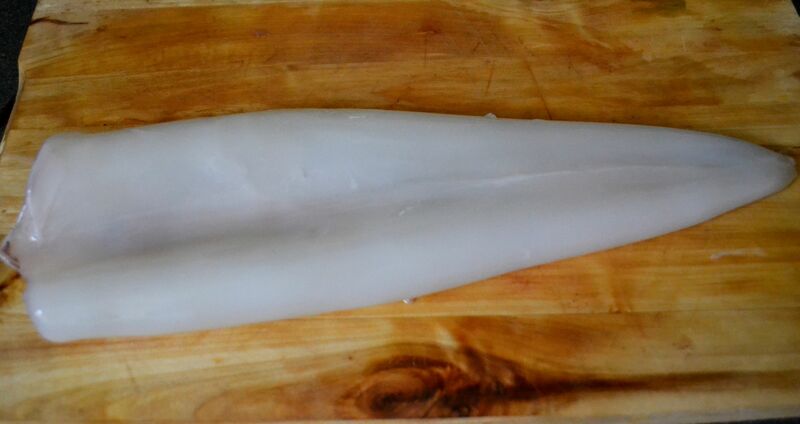 Let me first state a qualifier: I’m a self-taught cook, so this is how I’ve TAUGHT MYSELF to clean squid (albeit while following the lead of my parents, who in my lifetime have probably decimated a metric ton of squid purchased from New York City’s Chinatown). Other people may have a different method or additional tips (please comment if you do!). Also, I should say, since the photograph above does not really convey the size of the above squid: it was a GIANT cephalopod. That plate it’s lying on is a dinner plate with a diameter of 11 inches. A right great beastie. Anyway, David, this one’s for you. Happy holidays. First, grasp the squid head firmly in your fist. (For smaller squid you’ll use your finger and thumb.) It’s best to do this over your sink. Pull the head away from the squid’s body. It will come out dangling innards and gooey bits and possibly an ink sac. Slice away the tentacles by cutting into the head just in front of the eyes. You should have a nice ring of tentacles without any hard beak, but if you’ve cut into the beak you can pull that away from the tentacles easily. If you like you can now pull the tentacles apart, although for smaller squid I like to keep them intact because when cooked they contract and curl beautifully. Inside the squid is the quill, or pen, which according to Wikipedia supports the mantle and serves as a site for muscle attachment. Pull it out and discard it. It will slide out easily. The exterior of the squid is covered with a skin. Under cold running water, peel the skin off the mantle and the fins. There is a similar membrane covering the interior of the squid’s mantle. With smaller squid it is not necessary to remove this, but with larger squid, you can peel this off once you’ve got your squid cut open. Pull off the fins — they will separate easily from the body — and rinse your squid well, making sure to remove any squoogy bits from the insides. (With smaller squid, you can literally turn the squid inside out to do this.) Set the fins aside to be sliced and cooked. 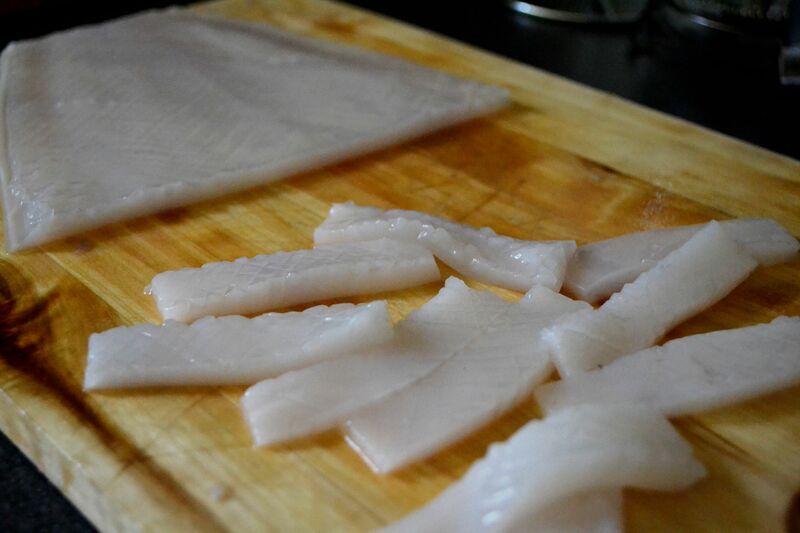 Last, cut the squid into strips of your desired length and width, which will curl when cooked. Et voilá! Recipe ready squid. Get cooking! This entry was posted in Methods and Essentials and tagged how-to, Squid by Susan. Bookmark the permalink. This is one of the most useful “technique” posts ever. I also remember cleaning pounds of squid as a child, but somehow I did not recall the exact technique (maybe I would have figured it out by mere instinct, but was too afraid to try). Now I can brave the fish market and buy some fresh squid for delicious eats! I can’t possibly imagine you being too intimidated to cook anything! But thank you so much for this response, I did get a little nervous about writing (a) a post that was not appetizing (gooey bits) or (b) told people something they know already. Thanks for this informative post.The pictures are good and clear and yes, I like how you pretty much glossed over the the gooey bits , as there are many in this story. Still I love squid and theres nothing like a beautiful fresh one ! Ooohhhh… are you saying that you’ve used ink that was older? Do tell! Gorgeous job!! You have such a way of simplifying horribly complicated tasks! Great Job! so useful! I will try to use this tecnique when I cook Squid soon!! Do let me know if you do and please report back with any feedback! This is such a helpful post. 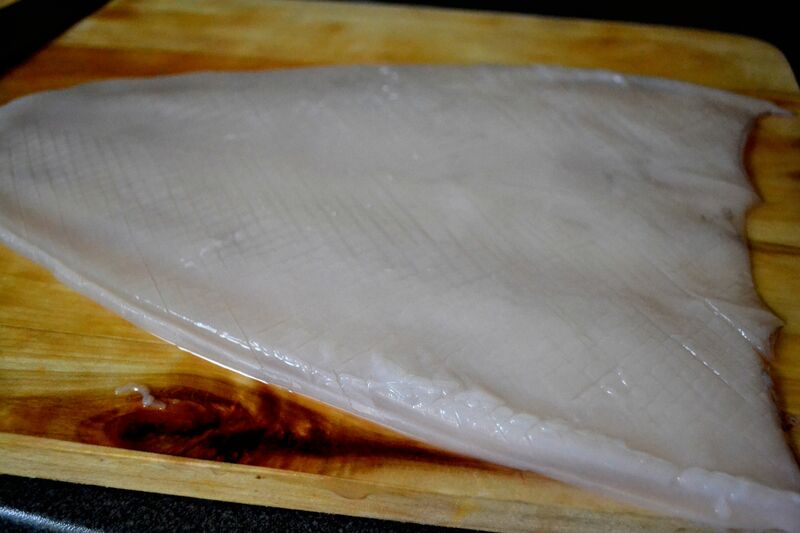 I normally ask my fishmonger to sort the squid out for me as we have such rubbish knives at home – scoring is about all I can do, but maybe I should be a bit braver in future! 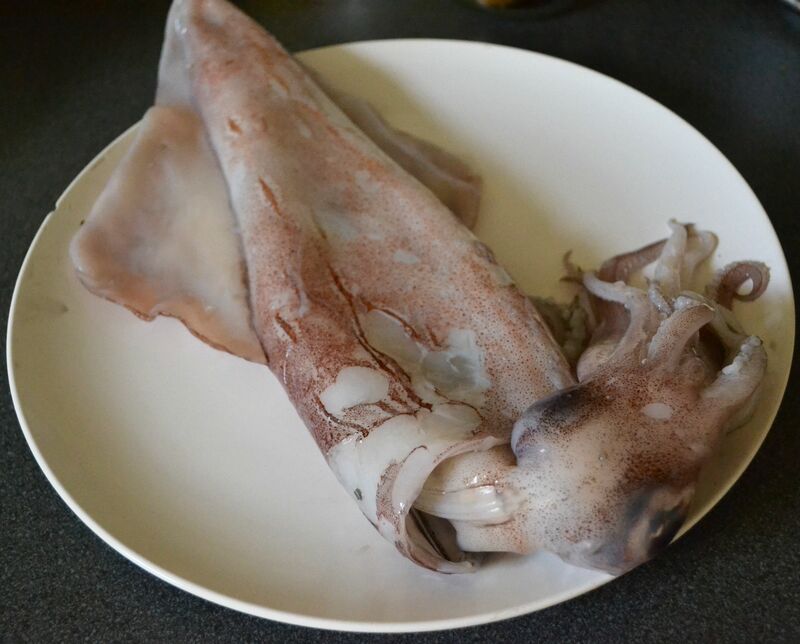 If you have a good fishmonger there is no need to tackle the squid on your own, but there is a perverse satisfaction in dismantling a squid from menacing sci-fi beast into tidy white cookable chunks. Thank you so much, Susan! What a marvelous holiday present: knowledge of how to dismantle a cephalopod is the greatest gift of all. That thing’s a freaking monster, and your diagonal cuts are so pretty and neat! The next time I dip on down to Chicago’s Uptown neighborhood, I’ll definitely get a squid, and do something wild with it. If you’re throwing a Big Wintertime Holiday Party, might I recommend Melissa Clark’s latke recipe? I just threw a somewhat-early Hanukkah party, and used her recipe to make latkes with potato, parsnip, and zucchini. There were also steamed Chinese dumplings, because why not? It’s almost Christmas. Some Jewish families order Chinese takeaway at that time of year. My family makes it. Also, I hope you had fun in the Caribbean! Thank you, and you’re welcome, and of course I did! Can’t wait to see what you produce when you tackle your own cephalopods.